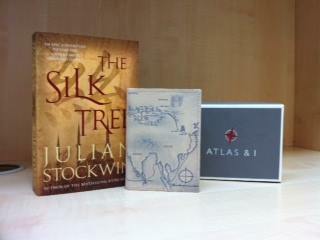 Contests: A Trio of Goodies! We all love a chance to win and I hope there’s something to tempt everyone here with not one but three prizes on offer! The contests close on July 20 and you may enter all for which you’re eligible. (The Silk Tree contest is restricted to UK residents; the other contests are open worldwide.) Best of luck! My publisher Allison & Busby has launched a competition to win a stunning unique leather notebook (with the map of the heroes’ route as the cover) plus a copy of the book. Enter the contest here. Tyger is the next book in the Kydd series, out in the UK and US in October. Twelve Advance Reading Copies are up for grabs! The greatest naval trial in the Georgian period is underway at Portsmouth with the court martial of Sir Home Popham, Captain Sir Thomas Kydd’s commanding officer in the doomed occupation of Buenos Aires. Kydd has some sympathy for Popham’s unauthorised action but his support for his former commander leaves him athwart some very influential people in the Admiralty. If you would like the chance to secure an Early Reading Copy of Tyger, several months before it is officially published, email admin@julianstockwin.com with ‘Advance Reader’ in the subject line and your full postal address in the body of the email. Would you like the opportunity to win a copy? Email admin@julianstockwin.com with ‘Miscellany’ in the subject line and your full postal address in the body of the email. Thanks Jules for the opportunity. This is one reason why I subscribe to your blog. Besides shedding insight on your travels that involve the research that you do for each book, you make it fun with your contests. I really enjoyed your poetry of the sea ones, as I keep a copy of “The Sea, Ships and Sailors” by William Cole on my desk. It is a collection of songs, poems and shanties from our nautical past and a connection to our seagoing forefathers. As usual looking forward to more Kydd adventures.